Buy Frisbees with your custom message. Wholesale Frisbees at low prices. Buy these with your custom message. 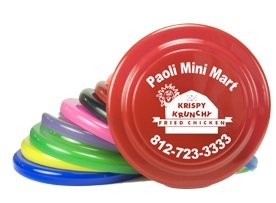 These flying saucers or frisbees are a great gift for Vacation Bible School! They are also great at company picnics for reinforcing paper plates and giving to employees to take home. Note our Special Low Prices. Give us a call (706-374-0710) for a FREE quote and to put our years of promotional and advertising experience to work for you. Name identification. If people see your name on a repetitive basis, they soon learn your name and become familiar with it. After becoming familiar with your name, and you have the high recall in their mind, they become comfortable voting for you. People do not feel comfortable voting for a stranger. Increasing your Name Identification -- the most important purpose of a political advertising campaign. Use a frisbee and a cheap discount bumper sticker. Opaque Item Colors for frisbee flyer: Blue, Red, White, Black, Yellow, Neon Pink, Neon Green, Neon Orange. 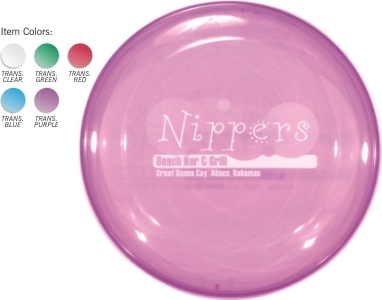 Item Colors for translucent Frisbee flyer: Translucent Green, Purple, Blue, Red. Name identification. If people see your name on a repetitive basis, they soon learn your name and become familiar with it. After becoming familiar with your name, and you have the high recall in their mind, they become comfortable voting for you. People do not feel comfortable voting for a stranger. Increasing your Name Identification -- the most important purpose of a political advertising campaign. Use a Frisbee flyer and a cheap discount bumper sticker.